I had so much fun last night with my kids. Just thinking about it made me smile right now. I fed them cheese last night while I was still baking the potatoes for their supper. And they love cheese. I sometimes let my son help himself. 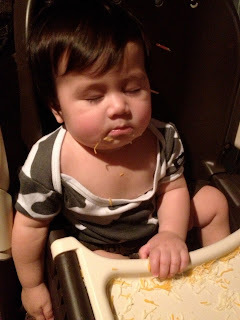 I just put the food in front of him, and the next thing I know, he is sound asleep. I laughed and laughed last night. Hello dear! I found you through the blog hop and I really love your blog... the title is so cute! That is such a hilarious picture :) Following you now, feel free to stop by my blog and say hello! Hello Ellie, thank you for dropping by.. I'm excited to hop onto your blog!